The Star Alliance has dropped the price of their flights from Seattle to Zurich, Switzerland down to $396 CAD roundtrip including taxes for travel in the peak summer travel season (August 2018). There are also some dates around Christmas and New Year's Eve (2017-2018) that are cheap. 2. Click on the departure date box to open up the calendar view and look for the cheaper date combinations. Look for the dates that are in the $400s and $500s roundtrip. NOTE: The cheaper dates around Christmas and New Year's Eve aren't showing up on Google Flights. See below. 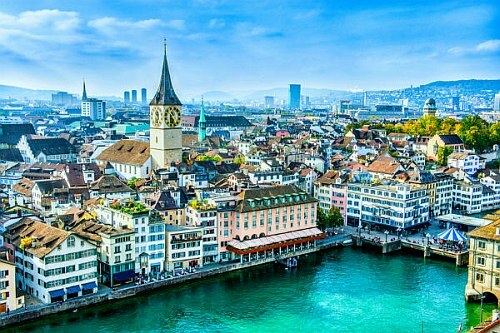 Search for a flight from Seattle to Zurich, Switzerland (ZRH). TIP #1: Look for the flights where the overseas legs are operated by Lufthansa or Swiss or Air Canada (better than United Airlines). Usually you can get a flight with one of these high quality airlines in at least one direction. TIP #2: Once your Momondo search completes, try sliding the Max Flight Duration slider on the left down to around 36, to filter out really long flights. flight deals, seattle, sea, air canada, switzerland, zurich, zrh, europe, western europe, lufthansa, swiss and united airlines. 3 Responses to "Seattle to Zurich, Switzerland - $396 CAD roundtrip including taxes | peak summer and Christmas flights"
Thanks again Chris. Great tips as always. Question: Many of these flights have reasonable outbound flight durations $12-15hrs) but inbound is 20-30hours. How can this be avoided and still get the good price? Thanks Sachmo: Once your Momondo search completes, try sliding the Max Flight Duration slider on the left down to around 36, to filter out really long flights. Sometimes there might be a flight that's technically a few dollars cheaper, but way longer flights. Using the Max Flight Duration slider can help weed those out. If that doesn't work, you might want to try a day before or after, for the departure date and/or the return date, to see if it helps.